Elder Abuse: 800-922-5330 for suspected elder mistreatment in the home; 877-662-8362 for suspected elder mistreatment in long-term care facilities. Domestic Violence: National Domestic Violence Hotline 800-799-7233 or Kansas Crisis Hotline for victims of domestic violence or sexual assault 888-363-2287. 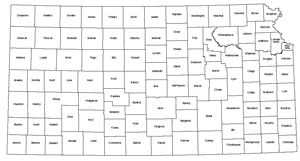 The Kansas Coalition Against Sexual and Domestic Violence maintains a list of county programs.